Everyone else in the room is confused. The guy (me) is frustrated. For the Green Bay Packers at tight end, it’s been the same approach three years in a row: sign a veteran, essentially ignore him, and then hit the offseason with a giant question mark. This time, the approach needs to be different. They need to draft one. The last time the Packers didn’t have to worry about the position was from 2009 through 2013 when Jermichael Finley was entrenched as the go-to guy. Ever since his career was cut short six games into the 2013 season, the Packers have been scrambling to find his replacement. Fortunately, this offseason, the Packers may have a chance at a mulligan with “the one that got away” or they could (finally) invest a high pick on one of the tight ends in this year’s draft. 2016 — Three years ago, it was Jared Cook. When the Rams released him, I thought the Packers should be interested because he could do some of what Finley did for them. This experiment worked. Although he put up modest numbers and missed six games with an injury, Cook was a game-changer in the postseason, catching 18 passes for 229 yards and two scores in the Packers’ run to the NFC Championship. People forget that when Aaron Rodgers made the “run the table” comment, it just so happened to be at the same point Cook returned from injury. Coincidence? However, the team was unable to re-sign Cook as an unrestricted free agent. 2017 — Rather than keeping Cook, the Packers signed Martellus Bennett. And Lance Kendricks. Admittedly, I was excited about the team bringing in Bennett’s colorful personality, but football games aren’t won with funny one-liners, and we all know how that turned out. 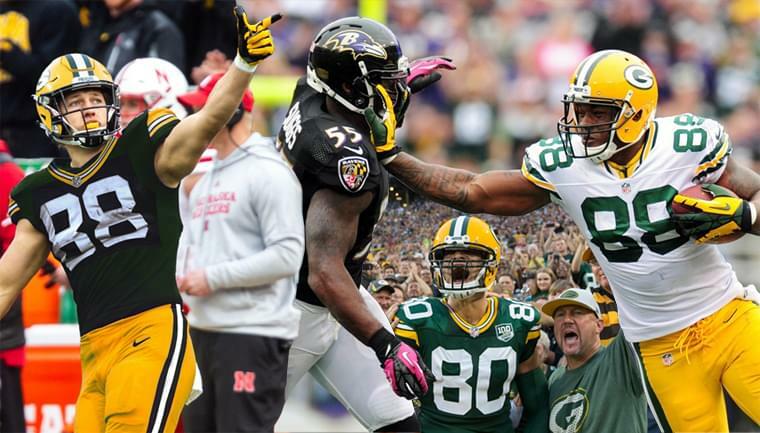 Bennett played in just seven games with the Packers, and was the definition of a free-agent flop. The Packers finished the season with Kendricks and Richard Rodgers, but had a gaping hole going into the offseason. 2018 — In comes Jimmy Graham. And Marcedes Lewis. Graham was thought to be the cream of the crop of free-agent tight ends. And even thought he disappeared in Seattle after putting up ridiculous, No. 1 receiver type numbers in New Orleans, the hope was that the Seahawks simply didn’t know what they were doing. Unfortunately, Graham in Green Bay looked more like Seattle Jimmy than New Orleans Jimmy. Graham was undoubtedly the most productive tight end the Packers have had since Finley—but with just 55 catches and two touchdowns this season—that’s not saying much. Graham remains under contract for the next two seasons. There’s a great breakdown of the Packers’ options with Graham on CheeseheadTV.com by Andy Herman — our “film guy” every Friday morning at 9:50 on “Air it Out” — which makes it pretty simple. Releasing him would cost roughly $7 million in dead money, whereas keeping him for one year would cost about $16.3 million. That’s a tough one. Of course, there’s always a chance they’ll kick the tires on Cook, and hope for a reunion with the closest thing they’ve found to what they had in Finley. In two seasons as an Oakland Raider, Cook has piled up 122 catches and 1,584 yards, leading to about a million questions from Packers fans. However, Cook turns 32 in April, and signing him to a multi-year deal would be risky at such a physically demanding position. If they bring back Cook, that would undoubtedly mean the end of Graham’s time in Green Bay. To break the cycle of “swing-and-miss-and-try-again-next year,” the Packers should take a page out of old Ted Thompson’s book of Draft-and-Develop. As a third-round pick in 2008, Finley’s rookie year was essentially a redshirt year, but there was no question that Finley was “the guy” going into his second season in 2009. In a perfect world, the present-day Packers could follow a similar template with Graham — or another veteran — playing the Donald Lee “mentor” role for a rookie. 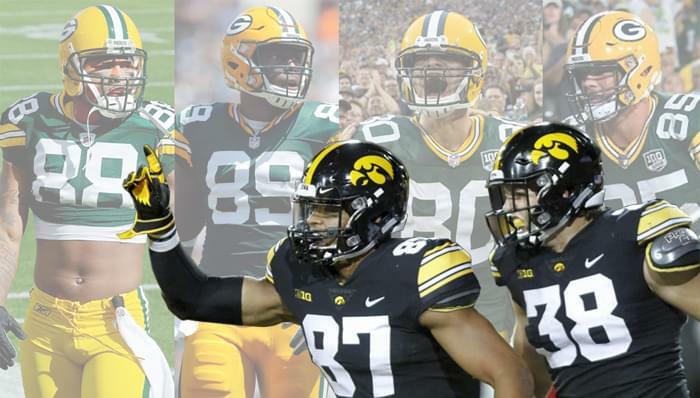 This year’s draft boasts a deep class of talented tight ends, starting with Iowa’s dynamic duo of sophomore T.J. Hockenson and junior Noah Fant. Both players could be picked in the first round, and the Packers are slated to make three picks in the first 44 selections. To me, Hockenson is the best of the bunch. Not only is he a high-end athlete capable of stretching the field, he’s already proven to be a punishing run blocker. Pretty impressive for a guy who played only two years of college football. Alabama’s Irv Smith Jr. and Stanford’s Kaleb Smith figure to be early picks as well, but given the Packers’ pattern of drafting players from Iowa—four since 2010—the stars may be aligned for this to be the year the Packers turn to the draft to find their next tight end. Do the Packers have bigger needs? Sure they do. It’s time for the Packers to try something new. Draft a tight end.